How does Saudi Arabia’s reliance on foreign labor affect its youth? Saudi Arabia's foreign worker population of 10 million is equal to half its native population. 2 in 3 Saudi citizens is under the age of 30. Many cannot find work due to abundant cheap foreign labor. 1. Saudi Arabia is heavily reliant on foreign labor. That is having significant economic and societal effects on the country’s future. 2. Perhaps most importantly, Saudi Arabia’s reliance on cheap foreign labor has crippled the development of its private sector. 3. With a native population of 20 million, Saudi Arabia hosts eight million legal foreign workers and 2-3 million illegal ones. 4. That means foreign workers do many jobs, leaving young Saudis idle, underskilled and unemployed. 5. 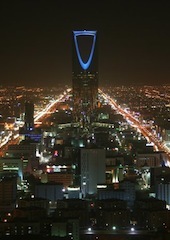 More than two-thirds of all Saudi citizens are under the age of 30. 6. The Middle East already has the world’s second-highest level of youth unemployment, after sub-Saharan Africa.